* New "Little Bay de Noc Trail" biking trail that follows the shoreline. Trail head is directly across the street from the cottage and we provide two adult and two kids bikes free of charge! * Numerous golf courses, lighthouses, museums, and more! * Take a day trip to Mackinac Island, rated the Number 1 Summer Travel destination in America in 2018! The ferry terminal is a 2.5 hour drive from the cottage so a day trip is very manageable. Little Bay De Noc is the Walleye fishing capital of the world and is home to many major fishing tournaments. In addition to Walleye you can also fish for Salmon, Bass, Trout, Perch, and several other species. Charters are available locally or you can fish from the newly constructed fishing dock which is just a few minutes walk from the cottage. In the winter months you will find Gladstone to be an ideal place for your skiing, snowboarding, ice fishing, or snowmobiling getaway. Snowmobiles are permitted on Gladstone city streets and local trails connect you to the rest of the Upper Peninsula and beyond. The recently renovated Gladstone Sports Park is perfect for beginner to intermediate downhill skiers and it boasts 3 rope tows, 1 wire, and 1 t-bar. It also has a snowboard run with a regulation half-pipe and an indoor chalet with concessions. The cottage is just 38 miles from the stunning Eben Ice Caves which is becoming one of Michigan's top winter destinations! There is plenty to do in Gladstone and the surrounding area no matter what the season. Other activities include lighthouse tours, gambling, golf, cross-country skiing, ATV trails, wreck diving, etc. etc. etc. Just let us know what you are interested in and we will try to help you arrange an unforgettable getaway! The 'Little Bay Getaway' is well-furnished and features both front and back decks to you can chose whether to enjoy the great view of Little Bay de Noc in the front or sit and relax under the trees in the large wooded back yard. Inside you will find a newly-remodeled kitchen and a large master bedroom with a sitting room to enjoy the view. The fold down couch in the living room is very comfortable and is a perfect spot for up to two children to sleep after a long day at the park. The bathroom includes a premium showerhead and full bathtub. There is even an acoustic guitar available for guests to use around the fire at night. Be sure to click the link under the calendar section for additional pictures and information. Upper Michigan has been named one of the Top 10 Travel Values in the World by Lonely Planet, the only place in the USA to receive this honor. Come up for a visit and discover why! Ron is a native 'Yooper' with roots in the Gladstone area. Although he moved away more than two decades ago he and the family make the trek from Fort Wayne, Indiana, to visit several times per year. The U.P. is a perfect place to unwind and take a break from Ron's hectic work schedule which has him traveling all over the world through most of the year. Ron and Katrina have a total of 4 kids who love to spend time in Gladstone as the location is perfect for kids. It is also a very friendly town where you will immediately feel welcome as you explore all that the area has to offer. In their spare time Ron and Katrina love to travel to exotic locations. Ron is a musician and guitar collector while Katrina enjoys puzzles and volunteer work. Ron's mother and grandparents are from Gladstone so he had the benefit of spending a lot of time here as a child. It's a great place to just hang out and enjoy the friendly local people and small town charm. The lifestyle here is very relaxed and the scenery in the area is truly beautiful. The sunsets over the lake are spectacular and you can occasionally even see the Northern Lights! It is the perfect place for a 'Getaway"! The location is great because Van Cleve Park and Little Bay de Noc (Lake Michigan) are just across the street. The park is beautiful and it offers everything from a public beach (where the water is actually quite warm due to the shallow bay) to a kids playland, to a new public fishing dock. Little Bay de Noc is known as one of the best Walleye fishing areas in the country and there are local charters available. In the winter you can enjoy the Gladstone Ski Hill which also offers tubing, and snowmobiles are allowed on city streets to allow easy access to the extensive trail system. Gladstone is small enough that you can walk to a local restaurant for a meal or visit the charming specialty shops downtown. Kitchen table and chairs along with TV trays for additional seating in the living room. Blu-ray available in living room. DVD in bedroom. Some games provided in headboard in master bedroom. Front and rear decks, large back yard with mature trees, Coffee maker with timer, iPod Dock, In-town location offers access to shops and restaurants. Wifi provided free of charge. This is a beautiful wonderful place. The view is amazing in the winter so summer must be as well. The location is wonderful not too far from anything you need. It's a place you should stay at when in the area. The property was very nice and well furnished, even a guitar! We were very impressed with the property. Good location and fun little town. It was furnished way beyond any other place we have stayed at. I normally bring my guitar with me but due to the amount of gear we had to bring, I left it at home. What a surprise to have one hanging on the wall with a pick, new strings and a kapo provided. I did have to tune it though! I would definitely come back again and no matter what season it would be comfortable. Thanks for being our guest and glad you enjoyed the guitar! Place was very welcoming and made you feel right at home. Extremely clean and everything we could of asked for and more. Thanks for the excellent review, we appreciate your business and welcome you back any time! 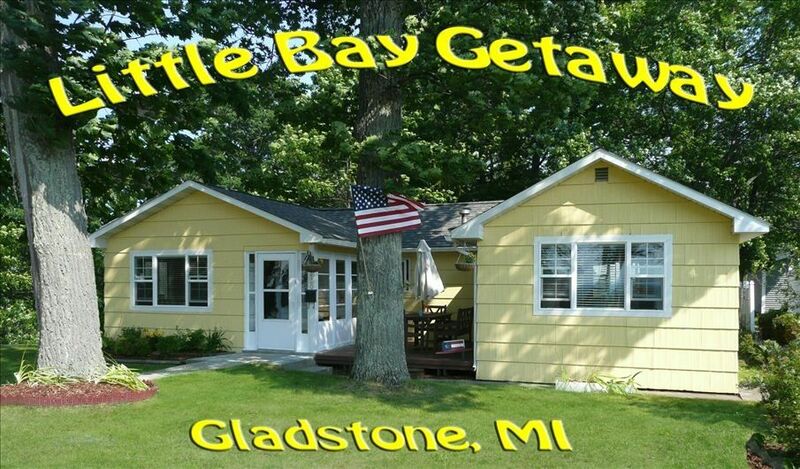 Little Bay Getaway is a quaint & cozy cottage, it will make you feel right at home. Had all the amenities one would expect, and then some. Perfect setting with a beautiful view of the bay! Great place, clean, comfortable, everything you need, great view of the lake! Thanks for the great review, we love feedback from our guests! Please visit us again in the future. Had everything we could possibly need, having W/D was a big help. Owners were very helpful. Bedroom is dark & a little dated-wish it had been as beautiful as the kitchen. Skateboard park, Kids Playground, Beach House with Showers and Concessions, fitness course, sand volleyball courts, boardwalk follows the shoreline - great for walking or biking. Bikes for touring Gladstone are available free of charge at the Yacht Harbor in the park across the street. Don't miss Gladstone's charming downtown district with local shops and friendly small-town service. Initial payment due of $200 is the booking and security deposit, which is refundable after your stay. The rental amount is due 30 days prior to check in.